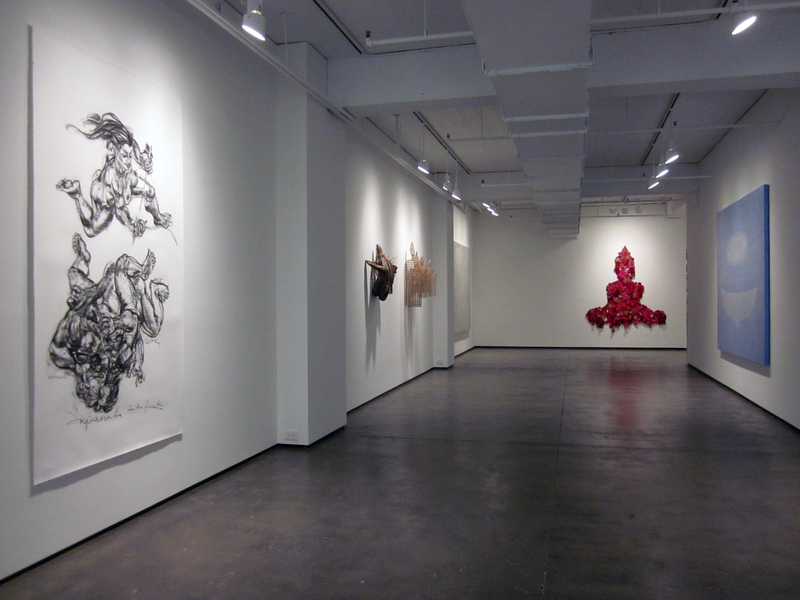 The 2010 Summer Exhibition at Tyler Rollins Fine Art presents selected works by six Southeast Asian artists represented by the gallery: Tiffany Chung, Jimmy Ong, Sopheap Pich, Pinaree Sanpitak, Jakkai Siributr, and Ronald Ventura. Vietnam’s most internationally prominent female contemporary artist, Tiffany Chung is noted for her sculptures, videos, photographs, and performance. A major preoccupation of her work is the exploration of popular youth culture in Vietnam, in particular cosplay and other Japanese influences. She has had numerous group and solo exhibitions and residencies throughout Asia and in the United States and was recently a featured artist at the 2009 Incheon International Women Artists’ Biennale in South Korea. In November and December 2010, she will present her second solo exhibition at Tyler Rollins Fine Art, featuring new drawings and embroidered works on canvas. One of the iconic Singaporean artists of his generation, Jimmy Ong has been noted for his large scale, figurative charcoal works on paper since his first solo exhibitions in the 1980s. His art explores complex themes of ancestry, sexuality, and identity. Ong was featured in a solo exhibition at Tyler Rollins Fine Art in early 2010. Entitled Sitayana, it was the artist’s provocative reimagining of the Ramayana from a feminist perspective. Cambodia’s leading contemporary artist, Sopheap Pich presented his first New York solo exhibition, The Pulse Within, at Tyler Rollins Fine Art in November and December 2009. Pich works primarily with bamboo and rattan to create free-flowing, biomorphic sculptures and installations. His works address issues of time, memory, and the body, often relating to his childhood recollections of life during the Khmer Rouge period (1975-79). In 2009, Pich was featured in two of Asia’s most prestigious art events: the Fukuoka Asian Art Triennale in Fukuoka, Japan; and the Asia-Pacific Triennial of Contemporary Art in Brisbane, Australia. Pinaree Sanpitak has been a powerful voice in the Southeast Asian art scene since her first solo exhibition in 1987 in her native Thailand. A central focus of her work is the female breast, which she relates to imagery of the natural world and to the iconic form of the Buddhist stupa. She works in many media, including painting, drawing, sculpture, textiles, performance, and culinary arts. Her work has been featured in numerous museum exhibitions and biennials in Asia and Europe during the past twenty years. In March and April 2010, she presented her first New York solo exhibition at Tyler Rollins Fine Art. One of Southeast Asia’s foremost contemporary artists working primarily in the textile medium, Jakkai Siributr is noted for producing meticulously handmade tapestry and installation works that make powerful statements about religious, social, and political issues in contemporary Thailand. A main preoccupation of his art is the interaction of Buddhism and materialism in modern life, and the everyday popular culture of Thailand. A highlight of 2009 was his participation as a featured artist in the Asian Art Biennial at the National Taiwan Museum of Fine Arts. He presented a second solo exhibition at Tyler Rollins Fine Art in Spring 2010. Ronald Ventura was showcased in his first US solo exhibition, Metaphysics of Skin, at Tyler Rollins Fine Art in September and October 2009. The exhibition featured a new series of paintings along with sculptures and works on paper. It marked Ventura’s first showing since his major solo exhibition at the NUS Museum in Singapore in 2008. One of the most acclaimed contemporary artists from the Philippines, Ventura has garnered significant international attention in recent years, and he now ranks among the leading younger artists in Southeast Asia.